Bring 500ml (2 cups) chicken stock and 500ml (2 cups) milk to the boil in a large saucepan. Pour in 170g (1 cup) polenta, whisking constantly. Reduce heat to low. Stir for 3-5 minutes or until thick. Stir in 40g (1/2 cup) finely grated parmesan and 30g butter. Spray a 26 x 16cm slice pan with olive oil to grease. Pour polenta into the pan. Set aside for 4 hours or until set. Preheat oven to 200ºC. Spray a baking tray with olive oil to grease. Use a 4.5cm round pastry cutter to cut 24 discs from the polenta. Place on the prepared tray. 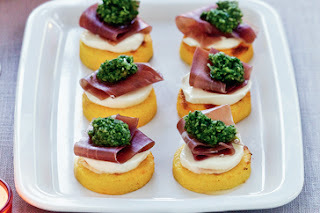 Lightly spray the polenta discs with olive oil and bake for 10-15 minutes or until crisp. Top each with a slice of bocconcini, a folded strip of prosciutto and a teaspoon of bought basil pesto.